Having the right tools and equipment will make any endeavor a more rewarding experience. I recommend acquiring the best quality supplies and equipment right from the start. Imagine trying to learn origami using construction paper! Whenever possible, I have suggested adequate substitutes. SHIBUGAMI - Shibugami comes in a range of sizes and thicknesses. The #10 thickness is the best general purpose weight. 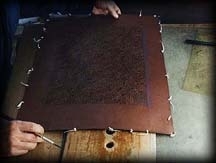 It is made of hand-made mulberry paper that has many layers laminated together using persimmon tannin. It is then smoked to preserve the paper and speed the curing of the persimmon. Synthetic substitutes are also available. In a pinch, good quality, washable, water-color paper may also be pressed into service. It will be harder to carve and not hold up as long as the papers made specifically for this task, but it should be fine for a small project. SHA-Stencils often need additional support, especially when there are very delicate lines or free-floating elements. The sha, a silk leno-weave gauze, supplies this support. CARVING KNIVES-Traditional carving knives have curved blades that make it easier to cut several stencils at one time. The blade is sandwiched between two pieces of bamboo and must be sharpened periodically. X-acto® knives work quite well as a substitute for the traditional knives. 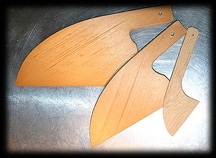 The blades may be easily changed as they become dull, and are fairly inexpensive. Be sure to get the kind with the rubberized grip and use #11 blades as shown. HOLE PUNCHES- Traditionally, stencil carvers make their own hole punches, often in very complex shapes. Circular hole punches, in a variety of sizes, are available for the studio artist. Click here for chart and directions for use. 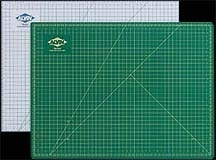 CUTTING MAT-To help facilitate sharp, clean lines when cutting a stencil, a mat is placed under the paper. The mat allows your blade to pierce the paper and at the same time protect your table top. The mat should be a bit resilient and should not contribute to the dulling of the knife, nor should it deflect you blade as your work. Older-style, professional carvers will use a mat of wood. Contemporary studio artists use a self-healing mat designed specifically for this purpose. When all else fails, an Olfa® brand type of quilters’ cutting mat will also do. LACQUER-In lieu of lacquer, I recommend using a high quality water based floor paint. It is less toxic and much easier to use. When shopping for paint, look for the most rugged. This will normally be indoor/outdoor paint or floor paint, and high gloss. Any color will do, but try to select a color that won’t be distracting as your use it. 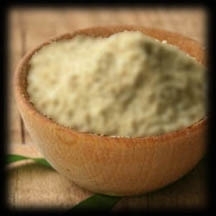 KOMON NUKA- Nuka is rice bran and may be found in any Asian market or health food store. But that is not the bran you will need. Komon nuka is very finely ground, de-oiled bran and must be manufactured specifically for making paste in order to work well. MOCHIKO- In the USA, mochiko is a domestic product produced by the Koda family in California. In larger cities it is available in any major supermarket or health food store. You may also be able to find it in gourmet grocery stores (it is used to make curry roux) and of course in Asian food stores. CALX (dyer's term)- A.k.a. calcium hydroxide (purchase from chemist), a.k.a. cal (used in making tortillas, konyaku, etc.) a.k.a. lime (available through farm supply stores), a.k.a. chalk (used on football fields). GLYCERINE- Available through drug stores. Use with, or instead of, table salt. It is an emollient, so it will help to keep the paste leathery without being too influenced by the daily changes in humidity. If you live in a rural area, it may also be found in feed stores. SURIBACHI- A suribachi is basically an old fashioned blender. It has grooves all along the inside surface of the bow. It is used to grind and mix. I’ve found that a bowl in the 10” range is most convenient when making paste. SURIKOGI- A surikogi is the pestle used with the suribachi. Any wooden pestle will do–even a broomstick handle in a pinch. PASTE BOARD- Your fabric will have a tendency to shift while paste is being applied and this can be very annoying when trying to accurately line up a repeating motif. The Japanese use a long, smooth board to which a layer of paste has been spread and allowed to dry. When you are ready to paste, lightly spray the board with a misting of water to make it tacky. Spread your cloth out smoothly over the surface and it will hold your fabric securely in place while you work. I have developed a slightly less efficient, but more convenient method: I cover a table top with indoor/outdoor carpenting, taking advantage of its velcro-like personality too hold my yardage in place. You may of course, also pin your fabric to a padded table. HERA (a.k.a. DEBABERA)- In English this may be referred to as a spatula or a spreader. There are a variety of styles. I prefer the type shown here–the handle and the curve make it much easier to see what the paste is doing as I spread it across the stencil. In a pinch, a silkscreen squeegee pay be used. 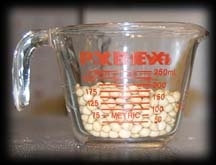 SOYBEANS- Dry soybeans may be purchased in most grocery stores and any health food store. America is one of the world’s leading exporters of soybeans. So if you go to buy them in an Asian market, they will most likely be from Iowa–even if the packaging is in Japanese! JIZOMEBAKE- One of the most difficult affects for dyers to achieve is an evenly solid background of color. Jizomebake have been designed to have the same number of bristles touching the surface of the cloth as long sweeping applications of dyes are made. Made of deer hair, it will last decades if given proper care. After each use, be sure to shake out as much dye as you are able, rinse the brush thoroughly, shake again, and hang to dry. It is important to set it aside at the end of the day and allow it to dry completely before using it again. SURIKOMIBAKE- These brushes are also commonly known as irosashibake. They are designed to be used in grinding the dyes into the surface of the fabric. Whenever convenient, hold them perpendicular to the surface of your cloth and move the brush in a circular motion using your wrist and your full arm and shoulder. 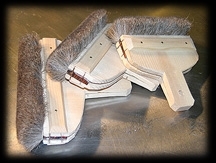 These brushes are made primarily of horse hair and come in a wide range of sizes. 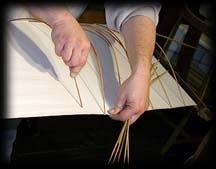 SHINSHI- One of the features of katazome is working on fabric that is stretched mid-air, much like a canvas on an easel. The stretching equipment is made up of the team of shinshi and harite. Shinshi are bamboo dowels with needles inserted into their tips. The shinshi should be longer than the fabric is wide. As the needled tips are inserted into the selvages, the bamboo is forced to bend. As it strains to straighten itself out the fabric is stretched side to side. I do not recommend that you try to make your own –it will only lead to heartache. Shinshi should be immersed in water for about thirty minutes before use. This helps them bend more easily and keeps them from splintering. They should also be soaked again after use and gently bent back into a straight rod. Allow them to dry before your next use. HARITE-The shinshi mentioned above stretch the yardage side to side, the harite are used to stretch the fabric lengthwise. Shinshi may be purchased, or if you are a bit handly with tools, they are fairly easy to make on your own. Click here for construction directions and a diagram illustrating how to suspend your fabric: HARITE DIRECTIONS. SPRAYER- The sprayer is used to moisten newspaper during the lacquering process and to make it easier to pull the stencil up from the fabric once paste has been applied. The easiest to use is as a pump sprayer, shown on the left. You may be able to find some adequate substitutes at gardening and import stores. 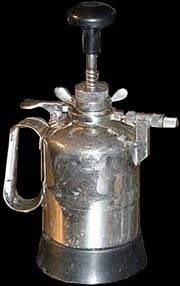 On the right is shown an old fashioned style of mouth sprayer, still preferred by many artists. PIGMENTS- Dyes come in many forms, both natural and synthetic. Pigments make up the oldest class of natural dyes and come in a large range of colors. You may make your own or purchase them commercially. All pigments need soymilk or some other binder to hold them to the cloth. Pigments may be produced from mineral sources, such as dirt (ocher), as well as plant and animal sources, such as indigo. 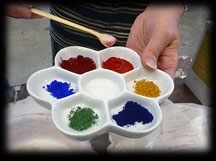 Commercial pigments may be purchased from stores that care quality paints for artists. You may also use high quality watercolors. Japanese pigments are available in an astounding range of colors but do be careful when purchasing pigments designed to be used by block print artists–they often contain finely ground glass to enhance the luster of the printed piece. 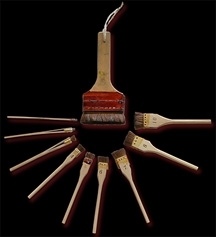 Japanese dyers often take advantage of the convenience of pigments in stick form, as shown to the right. 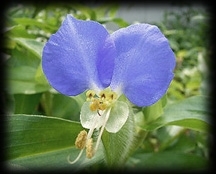 AOBANA- One of the weakest of all natural dyes, aobana (blue flower) has found great popularity among artists. It is used to sketch out designs and register marks on the silk before dyeing begins. This is especially important in designs that must register with several other panels or be placed just so on a garment. For artists using rice paste resist in a cone (tsutsugaki) it is especially useful in transfering complicated designs to the cloth before paste is applied freehand. 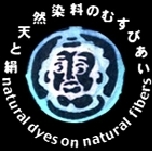 Aobana is produced as both a natural and a synthetic dye. It has also found great popularity among quilters in the West, in pen form, to mark out cutting and sewing lines. 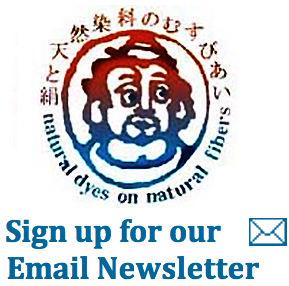 Once dry on the cloth, aobana dissappears on contact with water. Some pen versions have been found to re-appear years later–causing much grief–but natural aobana and the liquid synthetic version I carry do not do this. Click here to read more about aobana.